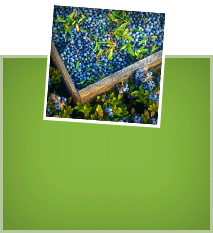 Wild Blueberries are genetically diverse, consisting of hundreds of different naturally occurring varietal clones. This mix gives Wild Blueberries their unique, complex flavors. This intense, sweet-tart taste is extraordinary and can’t be duplicated through cultivation of a single variety. Cultivated Blueberries are genetically narrow. By propagating a select few varieties, growers produce a blueberry of consistent size, with a very different character and flavor than the naturally more complex wild ones. Try our Wild Blueberry recipes to experience the extraordinary. Wild Blueberries give you more than twice the number of berries per pound compared with cultivated blueberries. That means your baked goods have more berries in every bite. The little wild ones also have a higher skin to pulp ratio. More skin and less water equal more antioxidant-rich pigment — and a better freezing blueberry. Cultivated Blueberries are uniformly larger, delivering fewer berries per pound, and more water content. More pulp and less skin means fewer antioxidants. It also means cultivated blueberries bleed more in baking and don’t freeze as well as the wild ones. 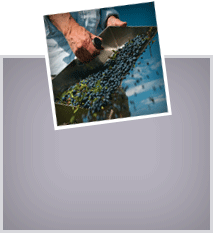 Learn more about buying Frozen Fresh Wild Blueberries. Wild Blueberries are true antioxidant superstars! They have twice the antioxidant capacity of cultivated blueberries, as measured by Oxygen Radical Absorbance Capacity. Diets containing foods with high antioxidant values such as fruits and vegetables are associated with reduced risk of chronic diseases. Cultivated Blueberries like the wild ones, contain phytochemicals called flavonoids, which deliver antioxidant protection to your cells. But if you want the biggest antioxidant bang for your blueberry, go wild! Learn more about the health benefits of antioxidant-rich Wild Blueberries. 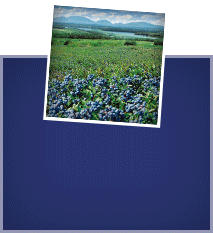 Wild Blueberries are naturally occurring lowbush blueberries. They have been growing in Maine, Quebec and the Maritime Provinces for over 10,000 years. Unlike cultivated blueberries, the wild ones are not planted. They spread naturally and slowly, with careful management. Cultivated Blueberries come from several highbush varieties that are propagated, planted and harvested in commercial operations throughout the U.S. and other parts of the world. 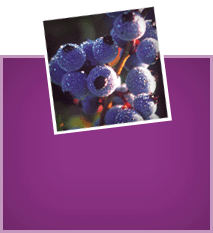 Learn more about growing Wild Blueberries. In addition to their more intense blueberry taste and powerful antioxidant capacity (2x what regular blueberries offer), Wild Blueberries contain less water than other blueberries – so they freeze and thaw like a dream. Keep these tiny “better blueberries” in your freezer so you always have them on hand to add a little “Wild” to your day. Frozen Wild Blueberries are perfect for adding intense, sweetly unique blueberry flavor to all your favorite pies, muffins, pancakes, and more. Pop a handful of Wild Blueberries into your smoothie for a boost of deliciously robust blueberry flavor – and a potent burst of nutrition!